Yamaha Introduces the All-New 2014 FZ-09 | Throttle Life! Powered by a fuel-injected, 847cc liquid-cooled, 3-cylinder engine mounted in an aluminum frame, the FZ-09 brings an aggressive new model to the already vigorous Yamaha line-up. This model was first revealed as an engine-only concept at the 2012 Intermot Motorcycle Show with this announcement: “With its clean torque output, this advanced new, light, slim and compact 3-cylinder engine will shape Yamaha’s future motorcycle line up.” Indeed, the 2014-model FZ-09 is a bold new model with a unique engine and look, and it’s packed with high-performance features. Performance components such as Yamaha’s YCC-T ride-by-wire throttle system, D-mode with 3 throttle position settings, adjustable suspension and variable throttle intake lengths are combined with the 3-cylinder Crossplane Concept crankshaft configuration for an even firing interval that provides plenty of smooth, linear torque. The result is a sound and experience like no other motorcycle on the market. 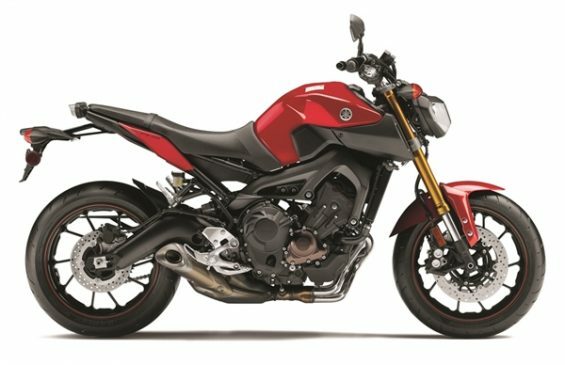 The FZ-09 will be available in two color options—Liquid Graphite and Rapid Red––and will retail for $7,990, with bikes available in dealerships starting in September. For more information on all Yamaha models please visit www.yamaha-motor.com.